Strange things are happening in Maya's tiny Vancouver Island town. First, her friend Serena, the captain of the swim team, drowns mysteriously in the middle of a calm lake. Then, one year later, mountain lions are spotted rather frequently around Maya's home and her reactions to them are somewhat . . . unexpected. Her best friend, Daniel, has also been experiencing unexplainable premonitions about certain people and situations. It doesn't help that the new bad boy in town, Rafe, has a dangerous secret, and he's interested in one special part of Maya's anatom - her paw-print birthmark. Ever since her best friend drowned strange things have been happening. Everyone in this strange little town works for the same research company but what really is the research? Maya knows that she feels more at home in the forest and she has a way with animals, especially cats and they tend to heal quicker around her. Maya finds herself drawn to Rafe, the new kid in town more strongly than she has anyone else. He's odd and his sister is even stranger. Finally Rafe comes clean about why he and his sister came to this town, but will Maya believe him? Little things are piling in his favor but its too much to wrap her head around, she wants to confide in her best friend Daniel who seems to be having his own special things happening but there never seems to be a good time. A forest fire rapidly approaching the town leads them all to evacuate but not before Daniel and Maya run into some strange people in the forest that they suspect started the fire and one of them may be Maya's biological father. Fast paced set up for a bigger story. This book ends on a cliff hanger, I almost wish it had just been written as one long book at least I would feel more closure. 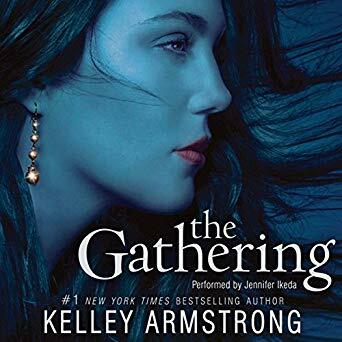 I like Armstrong's books, the mythology she bases them on and how she creates her characters I just felt this one was more of a prequel, and now I have to read the others to find out the rest of the story. It left me a bit unsatisfied.